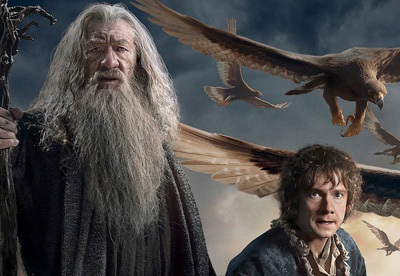 The Final Trailer for The Hobbit: The Battle of the Five Armies! Warner Bros. Pictures and New Line Cinema have released the final trailer for Peter Jackson’s The Hobbit: The Battle of the Five Armies which you can watch below! Opening in 3D, 2D and IMAX 3D theaters on December 17, the third installment stars Ian McKellen, Martin Freeman, Richard Armitage, Evangeline Lilly, Lee Pace, Luke Evans, Benedict Cumberbatch, Stephen Fry, Cate Blanchett, Ian Holm, Christopher Lee, Hugo Weaving, Ken Stott, James Nesbitt, Orlando Bloom, John Bell, Manu Bennett, Jed Brophy, Adam Brown, John Callen, Billy Connolly, Ryan Gage, Mark Hadlow, Peter Hambleton, Stephen Hunter, William Kircher, Lawrence Makoare, Sylvester McCoy, Graham McTavish, Dean O’Gorman, Mikael Persbrandt and Aidan Turner.